Church bells. Lying in bed at Batumi on the Black Sea shore, I hear church bells. It is a sound with emotional overtones that sets off memories of home. After a 21-hour bus ride across Turkey, one of the heartlands of Islam, I am once again in a mainly Christian country. I have arrived in Georgia. It is a little counter-intuitive so far east of Istanbul to be in a land that considers itself so very firmly to be part of Europe and of Christendom. Georgians and their neighbours to the south, the Armenians, are proud of being the first nations to convert to Christianity early in the 4th century, before Theodosius adopted it as the state church of the Roman Empire in AD 380. 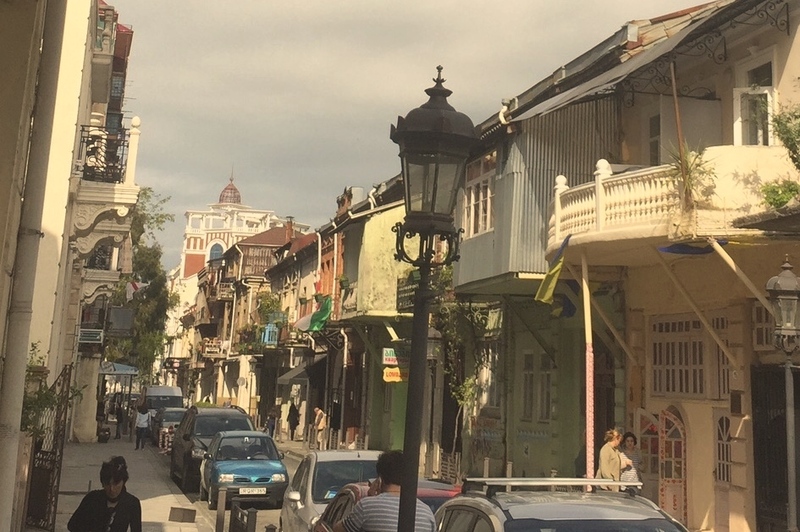 I am staying in a hostel in Batumi’s old town, an attractive medley of houses, many with balconies. The town is known for its variety of architectural styles, including Art Nouveau, Art Deco, Neo Classical and Italian Baroque. I pop out to a corner shop to buy milk for my breakfast. The shopkeeper has a face that seems to be a landscape of nervous tics. He picks up a bottle of something that is not milk and pours me a shot, all the while winking and saying in Russian “Home-made, home-made”. Eventually, despite the earliness of the hour, I feel obliged to down the lot. This is, of course, an attempt at a sale, but it feels like my first encounter with the legendary alcoholic hospitality of Georgia. Batumi is the first Georgian town I have seen. It is both port and seaside resort, but Batumi has neither golden sands nor crashing surf. A wide pebble beach stretches south as far as the eye can see and the Black Sea looks rather like a giant mill pond. I have never felt quite the same about this stretch of water since reading Neal Ascherson’s masterly book “Black Sea”. The huge accumulation of H2S has occurred because five major rivers run into the Black Sea – the Danube, Kuban, Don, Dnieper and Dniestr. The great volume of organic matter from these rivers has shaped the chemical composition of the sea. The Mediterranean, by contrast, receives the water of only three major rivers, the Rhône, Nile and Po. Batumi has sought to supplement what the Almighty has given it with some very attractive gardens and pedestrian boulevards set back slightly from the shore and a series of initiatives which include a gambling industry. A taxi driver tells me that Batumi has 15 casinos. They certainly loom large in the town and if you itch to bet a fortune at the gaming tables there is no lack of opportunity. I have hit a seaside resort in the off season and it is what it is. One evening I am the only customer dining in a restaurant in the old town. Into this very sleepy atmosphere slips a brisk young man who sits at a nearby table. In clear North American tones he tells the waitress: “I am from New York.” Then, after a brief pause, he adds plaintively: “It is very quiet.” There the conversation ends, confirming his point. Batumi has not always been quiet. Historically, western Georgia has played a very canny game, with involvement in the key commodities of the era. Wealth, at least for an elite, and occasional violence have been running themes. In the Ancient World, this region was one of the centres of gold and silver mining. According to the Georgian National Museum, gold mining began in Georgia in the fourth and third millennia BC. Western Georgia was the ancient kingdom of Colchis, which features in one of the most famous stories in world literature. This is where Jason came with his Argonauts to steal the Golden Fleece. 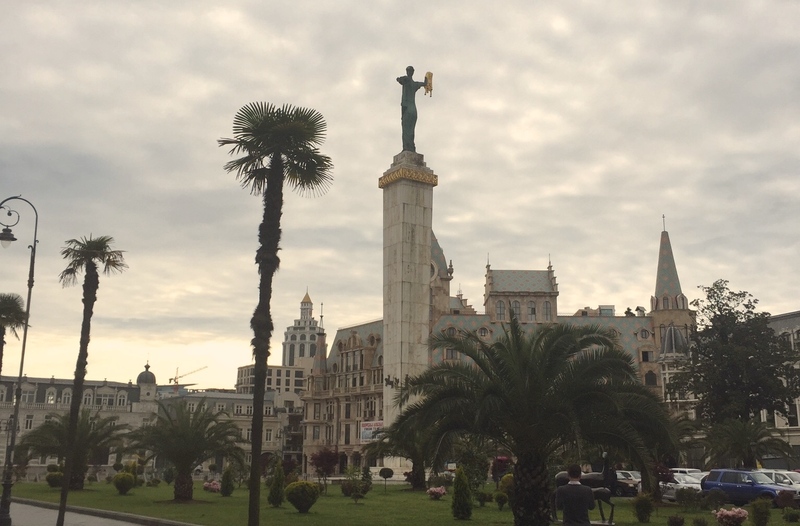 In Batumi, they have erected a very tall monument to Medea, daughter of a king of Colchis who fell in love with Jason and became his wife. There is still gold in them thar hills, but in the 19th and 20th centuries it is oil that has caught the attention of entrepreneurs, revolutionaries and governments. In 1901 a young Georgian revolutionary later known to the world as Stalin came to Batumi and soon found work with the Rothschilds who owned an oil refinery in the town. According to British historian Simon Sebag Montefiore: “On Stalin’s first day at work the Rothschilds’ refinery mysteriously caught fire.” Stalin spent some time imprisoned in Batumi. But this Bolshevik arsonist did not halt the march of the Caucasus oil industry. In 1906 the world’s first long-distance oil pipeline opened, linking the oilfields of Baku on the Caspian Sea to Batumi, which was now clearly a nerve centre of the world economy. A few years later the British army came to Batumi, drawn like Stalin not by the charm of the pebble shore but by the oil. A British military governor backed by 20,000 troops briefly ruled the region just after the First World War. I feel that I have arrived in a country with so many interesting threads that I could sit here for days writing, writing and writing. I will open up next one more thread in this post because it seems to me so important. 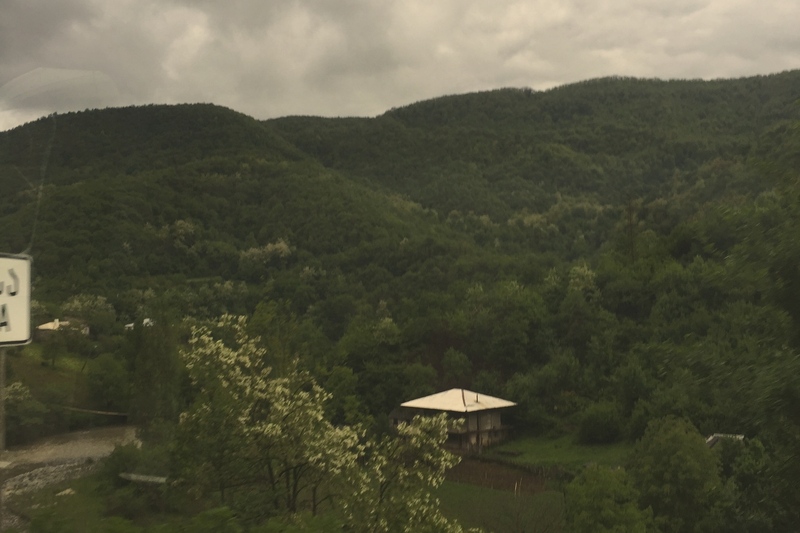 From Batumi I have travelled on to the capital Tbilisi, a six-hour bus ride covering about 360 kilometres. I have crossed more than half of the country. My overwhelming impression on the bus journey was how green and lush the landscape is, how richly covered with trees. I have dug out a few official statistics. Nearly 40 per cent of Georgia’s territory is forest. England, by contrast, has a little over eight per cent of its land covered by forest and even back in the 11th century Domesday records show that the figure was only 15 per cent. Georgia can still boast of brown bears, wolves, lynx and jackals, indeed more indigenous animals than any country in Europe except for Russia. For the past five weeks I have been either in cities or on buses and trains. I feel the wilds of the High Caucasus calling me and I must away.